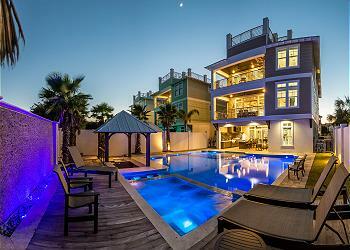 DETAILS: This coastal contemporary home is perfectly situated, capturing beautiful gulf views. "Oysters and Pearls" has unparalleled amenities including a resort style pool area complete with a sunken swim up bar and adjoining spa, in pool concrete picnic table & covered outdoor summer kitchen. This home also includes multiple indoor and outdoor living areas, private commercial grade elevator, dual master suites with gulf views, built in bunkbeds, and indoor and outdoor surround sound system. The first floor layout boasts a spacious bunkroom, full size laundry area, secondary bedroom with ensuite bath as well as an industrial style game room complete with pool table & built in wet bar including a full size contemporary paneled fridge. The second floor is the focal point of indoor living space with a sleek contemporary living room featuring pecky cypress ceilings, floor to ceiling windows to soak in natural light and open to the kitchen & dining room for optimal flow. The ample sized kitchen features floor to ceiling custom cabinetry, a hand built custom hood perfectly framing the 60" Wolf professional series gas range, SubZero appliances with extra storage anchored by dual center islands crowned with gorgeous quartz countertops. The second floor also features two guest bedrooms with ensuite bathrooms, convenient half bath as well as access to the second story outdoor dining area overlooking the lagoon style pool. The third floor features two guest bedrooms, a sitting area with built in full-over-full bunks, as well as dual master suites with spacious porches, laundry area, as well as a fourth story viewing deck to maximize the incredible gulf and western oriented views that surround this prestigious home. Shirah Street has direct beach access point steps from the home and is located near Destin's world class golfing, dining, shopping & entertainment. We had a fabulous time. We were celebrating our retirement with our children and grandchildren. This property is beautiful and we will most certainly stay here again. It was the perfect place for our family. Beautiful! Great home, very roomy. very spacious and equipped. easy access in and out and friendly cleaning people and pool guy etc only recommendation, second floor, bedroom with large bed and two bunks, has it's own bathroom, the bathroom needs blinds or privacy covering as neighbor 3rd floor can see right through to bathroom shower area. We are so glad that you and your family enjoyed your vacation with us in Destin! We agree that this home is a wonderful option for a fun and relaxing beach getaway and the location is wonderful! We will share your valuable feedback regarding the bathroom curtain and see about getting that rectified. We look forward to seeing you again soon! My family spent a week at this wonderful house! We loved the house, beds were all so comfortable and nice bedding and the outdoor area and pool is fabulous! The few maintenance issues were fixed immediately by Jerry with 360 Blue! Victoria with 360 Blue was so efficient and accommodating! The house is very close to the Shirah Street beach entrance! We grilled many nights in the fabulous outdoor cooking area! The house-beach-concierge service is 5 stars! I will highly recommend this house and 360 Blue! We had a great time in Destin! We are so thrilled that you enjoyed your vacation with us in Destin! We agree that this home is very accommodating and a great option for a beach getaway. We are also so pleased that you had a great experience with our team and we will be sharing your thoughtful words! We hope to see you again very soon! AMAZING home! We came for Spring Break with 4 families (8 adults, 9 kids ranging 6-13 y.o.). We eyed this home when it was being built last year. It lived up to our expectations and then some. The bedrooms were perfectly situated, spacious and super comfy beds/pillows. Some of our absolute favorite things about the house were the bikes, proximity to the beach, pool table, TVs everywhere (awesome for March Madness), whole house sound system (Sonos or Apple Air Play! ), and roof-top. The kids were in the pool morning-night. It gets shaded in the afternoon which would be especially nice in the summer months. 360 Blue has outstanding service. The maintenance guy, Matthew and another guy (can’t remember his name...dark hair with a beard) were so helpful showing us how to work the pool control and sound system. We had an issue with our internet not working and they came out and fixed it right away. Great vacation. We’ll definitely be back! We are beyond thrilled that you had such an amazing spring getaway in this incredible home. It sounds like you loved it as much as we do. We hope to see you back soon for your next beach getaway! Oysters and Pearls was the perfect Christmas vacation location for our family of 14. The property was immaculate and guest services was quickly responsive when needed. The house was spacious for group meals and games, yet with intimate spaces for stealing away to snuggle with a book. Looking forward to renting this property again in the future. Thank you! We love to hear that your family made some awesome Christmas memories in one of our homes! The location and the spaciousness that "Oysters and Pearls" provide make it the ideal place for large groups who like to gather for big meals and game time, relax alone with a good book, or explore what Destin has to offer. We pride ourselves on making the guest experience second to none, and are so glad to hear that our guest services team were quick to respond to your needs. Thank you for you feedback! We are looking forward to helping you plan your next perfect vacation! This house is amazing. It feels like your own personal resort. It is so big and roomy. Plenty of space to enjoy time together yet still space to get away and enjoy some peace and quiet. The pool is beautiful. We enjoyed the swim up bar. We really liked the poolside game room. The view from the rooftop deck is perfect for morning coffee or an evening cocktail. It is literally an easy 3 minute stroll to the beach. Comfy beds. Luxury furnishings. I’m ready to book 87 Shirah again! We are so thrilled that you enjoyed your stay in Destin so much! This property really is one of a kind, and perfect for a fun, group getaway! We are happy to hear you got to enjoy some relaxing time on the rooftop deck. The views are spectacular! Thank you so much for choosing 360 Blue, and taking the time to share your experience with us! We hope to see you back at the beach again soon!